Madikwe Safari Lodge is owned by the More family who are constantly redefining luxury African safaris. 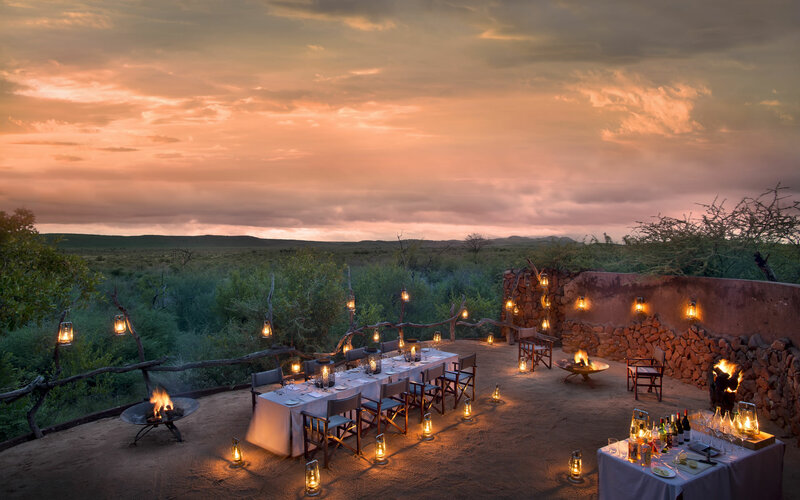 They have conceived and created three extravagant camps spread between two picturesque and boulder strewn hills on the eastern side of the magnificent Madikwe Game Reserve. The three camps offer exquisite privacy and romance, the premier family safari experience and the perfect place for small groups and celebrations. All of this surrounded by the abundant animals and unforgettable scenery of malaria free Madikwe. Lelapa is a sumptuous 12 suite camp that offers the premier family-orientated safari with specialised rangers and facilities for budding young naturalists. Kopano, with just four suites, boasts exceptional privacy and indulgent luxury. It is perfect for romantic African getaways and honeymoons. Dithaba, higher up the mountain and boasting awe-inspiring panoramas , consists of four lavish suites and is ideal for small groups or families that want to book the whole camp and turn it into a luxury safari home away from home. The three charming camps are situated within walking distance of each other. This means that Madikwe Safari Lodge can cater for large group safaris, weddings or other celebrations where all 20 suites are required. Madikwe Safari Lodge’s highly-trained rangers are equipped to show you all the wonders of the reserve – as a family, as a couple in love or as a group of friends. There are specially designed wilderness activities for children of all ages. For couples looking for the ancient romance of Africa, there is exceptional seclusion and peace on safari. Madikwe Game Reserve, proclaimed in 1991 is a South African conservation gem. It is 75 000ha of land consisting of state owned and some private land. What was unproductive and damaged farmland has been restored to a haven for 10 000 head of game including all of Africa’s iconic species – lion, leopard, elephant, black and white rhino, buffalo, wild dog and cheetah. 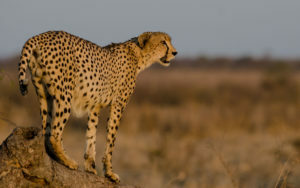 There are teeming herds of general game including wildebeest, zebra and springbok. Madikwe rests on the edge of the Kalahari Desert. It is semi-arid, receiving just 350mm of rain annually but despite this supports an astonishing variety of fauna and flora. More than 60 species of mammal have been recorded at Madikwe and the bird list is now topping 350 species. In the east, Madikwe is bounded by the Marico River – a perennial stream. To the west lies the Kalahari and the northern border is the national boundary with Botswana. The south is bounded by the purple and red Dwarsberg Hills. Undulating woodlands stretch north from the hills eventually falling over the Tweedepoort escarpment onto the low lying savannahs and grassland. The plains are dotted with inselbergs where baboons, hyrax and klipspringer keep a watchful eye for the attentions of Africa’s elusive leopard. While providing a refuge for South Africa’s natural heritage, Madikwe has created an entire economy which supports the local people living around the reserve – predominantly through employment. This support for local people is crucial if conservation and ecotourism are to achieve grass-roots support. Travelling to Madikwe Safari Lodge is simple. Iconic Africa recommends the daily scheduled flight from Johannesburg OR Tambo International Airport. This is comfortable 40 minutes on a modern aircraft straight onto the Madikwe airstrip. From the airstrip, there is a short picturesque drive to the lodge. If you prefer to keep closer to the ground, Madikwe Safari lodge is an easy 4.5 hour drive from Johannesburg OR Tambo International Airport. Iconic Africa can hire you your own vehicle or we will arrange a comfortable road transfer with one of our reputable partners. Iconic Africa has developed an excellent rapport with and respect for the More family who have been at the forefront of ecotourism for four generations. This gives us access to the best possible rates and availability. Our specialist consultants will tailor your trip to Madikwe and recommend other exciting destinations to combine with your safari. For families Victoria Falls is an excellent option and for ultimate romance, &Beyond Benguerra Island off the Mozambique coast is exceptional. Iconic Africa is constantly awed by malaria free Madikwe. The reserve unfailingly delivers breath-taking animal sightings while the changing beauty of the landscape is a constant inspiration. The More family have harnessed the essence of this African wilderness with the luxury and splendour of Madikwe Safari Lodge and tailored the experiences to ensure the perfect get away for honeymooners and families alike. Allow one of our passionate consultants to help you design and African holiday that will leave you with a lifetime of great memories. Specially designed wilderness activities for children. Click on the [ ] in bottom right hand corner of the video once it is playing to watch it in fullscreen. Why Book With Iconic Africa? Save up to 20% with our superior rates! We promise to beat any quote you have been given! As we are situated on African soil we are able to remove the middle man. Africa by African Specialists with decades of knowledge. We’ve physically been to every destination. Only the hand-picked elite and most exclusive destinations. Relax and let us take care of everything. We uplift and give back to Africa with every booking we receive. We do this for the love and promise you the ultimate African adventure. Teams based in the USA and South Africa to help you every step of the way. Madikwe Game Reserve is one of the few year-round safari holiday destinations and one of the best options for getting the best of Africa at any time of the year. Here’s a little more on what to expect in each season. The winter months (May-September) are considered the best time of year for wildlife viewing as its dry and rain is scarce. Vegetation is sparse so it is much easier to see the game. Temperatures are mild, although it may get chilly on early morning and evening drives. There are not too many tourists. The summer months (October to April) bring lots of rain and higher temperatures. The landscape and vegetation is green and lush and its beauty will overwhelm you. Game viewing is still sensational at this time of year as there are lots of newborn animals around and migrating bird species are present. The parks are more crowded at this time of year. Madikwe Safari Lodge is another of the More family’s most remarkable creations. Ideal for families. Ideal for romantic getaways. Ideal for restoration in Africa’s wilderness. To begin your safari of a lifetime simply contact one of our African travel experts and begin your journey to Africa with us now! Lelapa, owned by the More family, is the premier safari experience for families wanting to experience the joy and wonderment of the 75 000ha, malaria free, Madikwe Game Reserve in absolute safety. Parents can travel this epic natural journey of discovery with their children or experience rejuvenating rest and sumptuous pampering content in the knowledge that their children are safe and entertained. Lelapa offers extravagant luxury and refined dinning for mum and dad while the kids have constant amusement and meals to suit their less discerning palates. Kopano is the Madikwe Safari Lodge’s premier private wilderness jewel. 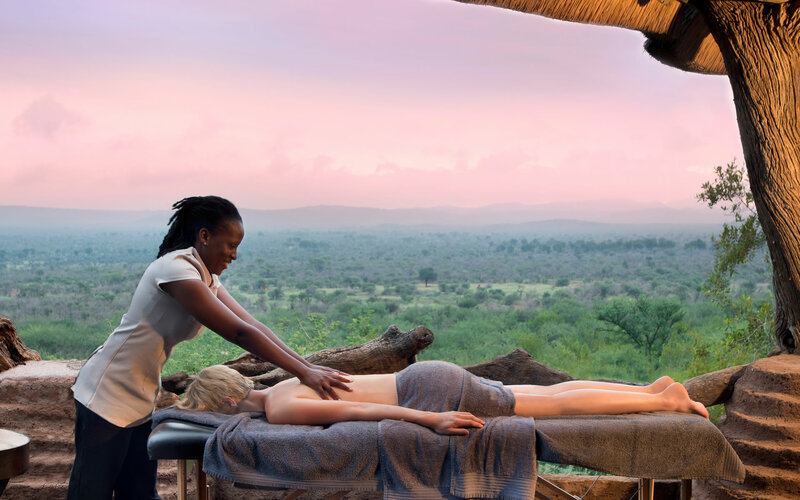 It offers intimacy and pampering – perfect for honeymoon and romantic getaways in the malaria free magnificence of the 75 000ha Madikwe Game Reserve. The More family has created a profoundly sophisticated, intensely intimate and vividly African experience that surpasses all expectations. Kopano and is a luxurious and immersive encounter with the wild that will leave you longing for more. Dithaba Camp is the More family’s spacious and gorgeous testament to the magnificent 75 000ha malaria free Madikwe Game Reserve. The camp, perched in the mountains of Madikwe, offers awe-inspiring panoramas of this precious wildlife sanctuary displaying endless savannah, woodland and mountains to the horizon. The four lavish suites with private butler, ranger, safari vehicle and chef offer the ultimate luxurious and immersive wilderness experience to families and groups. Connect with Iconic Africa on our social channels to get great tips and news on African travel. See our brochure here. Please use the relevant contact details below should you have any questions regarding your next African safari.